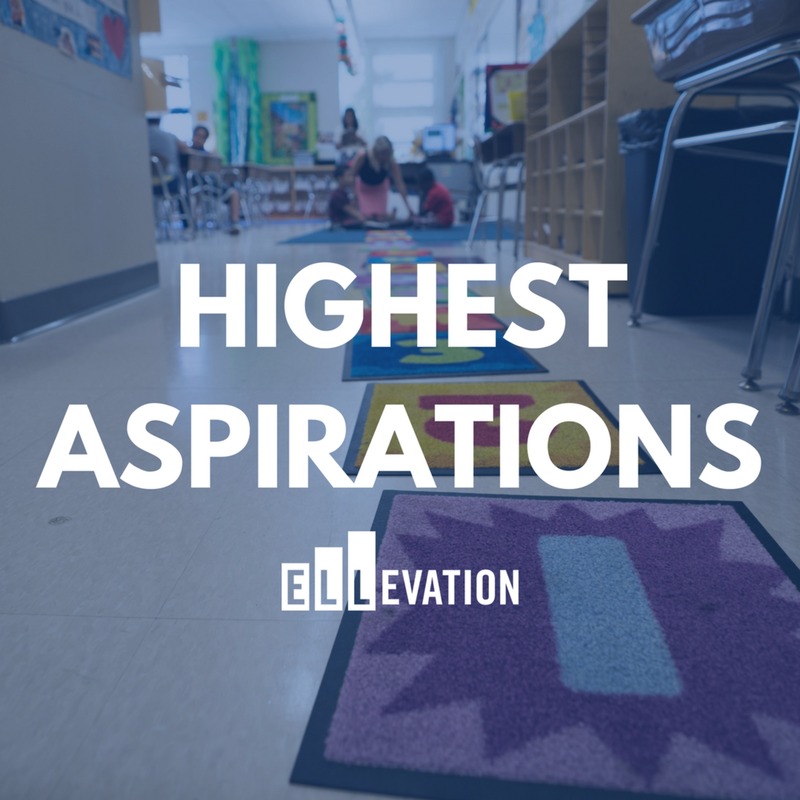 On the Highest Aspirations Podcast, we engage in important conversations about the most rapidly growing student demographic in the United States - English Language Learners. We speak with educators and students, researchers and policy makers, and parents and community members about how we can help all students reach their highest aspirations. Join us on this important journey as we bring the vibrant ELL Community together around the topics that matter most to the students we serve. In the second of a 2 part series, we continue our conversation with Eddie Williams, the teacher featured in Helen Thorpe’s book The Newcomers. How might teachers handle the draw of smartphones, texting, social media in their classes, particularly when working with English learners and newcomers? What is the appropriate balance between structure and agency when working with English learners? How do effective coaches encourage new teachers to increase their impact without becoming overwhelmed? All that and what Eddie hopes readers will take away from the book. We pick up right where we left off with a discussion about one of the most common challenges that all teachers face. For more information about the episode and the resources Eddie recommends, please visit Ellevation's ELL Community. How might an EL teacher and his dynamic newcomers class react to having a journalist embed herself in their classroom for an entire school year? What partnerships might they form to learn more about students and what does this tell us about the resources schools have and do not have at their disposal? What are some of the best things about working with students who come with such a wide array of backgrounds, experiences, and skills? We discuss these questions and much more in our conversation with Eddie Williams. Eddie’s newcomers class at Denver’s South High School was profiled as part of Helen Thorpe’s latest book entitled The Newcomers. In her book, Thorpe describes Eddie by stating, “He was like a gardener, excited by seedlings. Where others might see students with limitations, or students who were lagging behind their peers, Mr. Williams saw a room filled with kids who had lived through titanic experiences, teenagers who could do anything at all, once they accepted whatever sort of history they had brought with them and grasped the full extent of the opportunity lying ahead. He often told me that he felt lucky to work in a room like this one - a room that spoke of just how big the world was, and how mysterious.” After speaking with him as a long awaited follow up to last season’s episode with Helen Thorpe, I think this description is far superior to any bio I could provide. Humble, passionate, and thoughtful, Eddie embodies the kind of educator who helps makes a difference in students’ lives by seeing all the assets they bring to our schools and communities. Eddie and I had a lot to discuss, so this is part 1 of a 2 part series. If you haven’t heard our conversation with Helen Thorpe, you can find it on Highest Aspirations Season 1 / Episode 19 anywhere you listen to podcasts. What are some effective and practical ways to differentiate reading comprehension strategies for English learners? How does motivation, relationship building, and autonomy impact student growth? How might family engagement strategies like home visits help provide actionable insight leading to better reading comprehension and perhaps more importantly, a joy in reading? We discuss these topics and much more with Larry Ferlazzo. Larry teaches English, Social Studies and International Baccalaureate classes to English Language Learners and mainstream students at Luther Burbank High School in Sacramento, California. He has written nine books, the latest of which is titled The ELL Teacher’s Toolbox (with co-author Katie Hull Sypnieski). He and Katie are presently, editing a series of practical classroom books for Social Studies, Science and Math teachers. They are also preparing a second edition of our The ESL/ELL Teacher’s Survival Guide. In addition, he is writing a fourth book on student motivation, Building Intrinsic Motivation in the Classroom: A Practical Guide. Larry has won several awards, including the Leadership For A Changing World Award from the Ford Foundation, and was the Grand Prize Winner of the International Reading Association Award for Technology and Reading. In the past, he has taught courses in the teacher credential program at California State University, Sacramento and the University of California – Davis. Larry also writes a popular education blog, a weekly teacher advice column for Education Week Teacher and semi-regular posts for The New York Times and The British Council. His articles on education policy appear in the Washington Post and in publications such as ASCD Educational Leadership, Social Policy, and Language Magazine. In addition, he hosts a weekly radio show on BAM! Education Radio. Larry was a community organizer for nineteen years prior to becoming a public school teacher - which is where we begin our conversation in this episode. What are some essential strategies that district leaders should put into place to make sure all students have the ability to engage in deeper learning? How can school leaders and teachers collaborate more effectively to maximize impact on diverse groups of students? What are some ways to strike the appropriate balance between structure and agency when implementing project-based learning practices? We discuss these questions and much more with Dr. Carmen Coleman, Chief Academic Officer of Jefferson County Public Schools in Kentucky. In 2018, Dr. Coleman launched the “What’s in Your Backpack?” video series, with each episode focusing on a specific aspect of the Backpack of Student Success Skills development. The program focuses on providing students with a backpack full of universal essential skills, such as critical thinking, collaboration, creativity and communication. Students fill their virtual backpacks with examples of their work and defend that work during the school year. Dr. Coleman previously served as an associate clinical professor at the University of Kentucky (UK) in the Department of Educational Leadership Studies. She was the program coordinator for the Principal Preparation Program and the director of the Next Generation Leadership Academy. Before joining UK, Dr. Coleman served as superintendent of Danville Independent Schools. Previously, she was director of elementary schools in Fayette County. She began her career in Scott County, where she worked as a teacher and principal. This episode is a follow up to S1/E10, when we spoke with Jefferson County's Donna Neary about "Accelerate to Graduate", her team's project-based learning initiative that helped newcomers graduate before aging out of high school. We were curious to learn more about the role school leadership plays in implementing this kind of program. As you will hear, Dr. Coleman provided us with that and much more! What is the Workshop approach and how might it help English learners improve their reading and writing skills? What is the appropriate balance between direct instruction and independent student work? How might we implement workshop style activities in classes with diverse groups of learners? We discuss these questions and much more with Valentina Gonzalez. Valentina is an educational consultant working with educators across the nation to support English learners. She works with schools and districts to provide professional learning experiences that are tailored to meet the needs of the participants. She specializes in creating presentations that are engaging and interactive. Valentina started her journey as an educator in 1997 as a third grade language arts teacher in Katy, Texas. She has served as an educator in many capacities since then, including teaching second and fourth grade. After leaving the classroom, she worked as an ESL Instructional Support Specialty Teacher on her campus serving and co-teaching in first-fifth grade classrooms. As a district leader, she has served as a facilitator for campuses and as a professional development specialist. Currently, Valentina shares her time as an independent contractor traveling to deliver professional development and working for a school district. For more information and resources about Valentina and this topic, check out our blog post on Ellevation's ELL Community. What does the research show about how dual language programs are impacting social and academic gains for students - particularly English learners? How might we promote buy-in to these programs from those who may still be uncertain about them? What role does language learning play in ensuring educational equity and how can dual language programs help? We discuss these topics and much more with Conor P. Williams. You may recognize the name as this is Conor’s second appearance on Highest Aspirations, and given his expertise and passion for this topic, we were happy to have him back. If you missed his previous episode, I encourage you to check it out - it is the first episode of Highest Aspirations. Conor is a fellow at The Century Foundation, where he writes about education, immigration, early education, school choice, and work-life balance challenges for American families. He is an expert on American educational inequity, English learner students, dual immersion programs, urban education reform, and the history of progressivism. Williams was previously a senior researcher in New America’s Education Policy Program, a senior researcher in its Early Education Initiative, and the founding director of its Dual Language Learners National Work Group. He has taught postsecondary courses at Georgetown University, George Washington University, and American University. He is a member of the National Conference of State Legislatures’ State Policy and Research for Early Education (SPREE) Working Group. Williams is a regular columnist at the 74 Million. His work has also been published by the New York Times, Atlantic Monthly, Washington Post, The New Republic, Dissent, Commonwealth, The Daily Beast, Talking Points Memo, and elsewhere. How might school districts form teams of educators with different skill sets to design and implement effective family engagement strategies? Why is it so important to create a solid action plan for family engagement and how might districts approach this work? How do family and community engagement practices positively affect EL student success in school and beyond? We discuss these questions and much more in our conversation with a great team from Cabarrus County Schools in North Carolina. In our first episode with three guests, we bring in ESL Counselor Stacey Diaz, High School ESL Teacher Emily Francis, and School Social Worker Doug Carr. As you’ll hear in our conversation, each person bring a unique skillset to best support EL students and their families in the district and community. This team based approach one of the key elements of success in Cabarrus and is replicable in other districts. As always, you can find more information on this episode and other important topics by visiting Ellevation's ELL Community. How might a back to basics approach help EL educators ground themselves in practices that can provide the most impact for the students they serve? What are some of the pitfalls of constantly searching for "the next new thing" and how can we avoid them? How might we help bridge the gap between research and practice when vetting, implementing, and assessing educational tools and practices? We discuss these questions and much more with Dr. Jana Echevarria. Jana is a Professor Emerita at California State University, Long Beach. She started out teaching in special education, but also taught in elementary, middle, and high school in general education, special education, ESL, and bilingual programs. She is a founding researcher of the SIOP Model, and her research over the years has focused on effective instruction for English learners, including those with learning disabilities. Jana has presented her research in the U.S. and internationally, including at Oxford University (England), Wits University (South Africa), Harvard University (U.S.), Stanford University (U.S.), University of Barcelona (Spain), and South East Europe University (Macedonia) where she was a Fulbright Specialist. In 2016, she was honored to be inducted into the California Reading Hall of Fame. Many of our listeners will also recognize her as the co-author of the highly regarded book, Making Content Comprehensible for English Learners: The SIOP® Model. As always, you can find more information and resources discussed in this episode on Ellevation's ELL Community. How are districts assessing criteria to achieve the Seal of Biliteracy? What supports are available for teachers with diverse groups of language learners? How can the Seal of Biliteracy help mitigate larger issues, like home language loss and equity in education? We discuss these topics and much more in part 2 of our 2 part series on the Seal of Biliteracy with Martha Hernandez of Californians Together. If you listened to Part 1, you know that Martha is both well versed and passionate about the history, current state, and future of the Seal of Biliteracy and its impact on language learners of all types. How has the Seal of Biliteracy evolved from a California-based grassroots movement to a highly regarded program offered in 35 states and the District of Columbia? How might offering the seal of biliteracy help school districts strengthen their language programs for all learners? What pathways and checkpoints are built into the journey toward the Seal to help guide students toward the ultimate goal of biliteracy? We discuss these topics and much more in Part 1 of our 2 part series on the Seal of Biliteracy with Martha Hernandez. Martha, the oldest of nine children, is a first-generation college graduate and a role model for her siblings who also earned university degrees and are now serving as physicians, teachers, a computer programmer, an organic chemist and a doctor of pharmacy. She attributes her family’s success to her mother who was an unwavering advocate for her children with a strong belief in the power of public education. Martha’s lifelong support of the United Farm Workers and bilingual education has fueled her commitment to causes of equity and excellence in education especially on behalf of English learners. Her 42 years of public school experience at the classroom, school, district and county levels as well as her involvement in numerous state committees serve her well to advance the vision of Californians Together. As you’ll hear in our conversation, Martha is both well-versed and passionate about the history, current state, and future of the Seal of Biliteracy and its impact on language learners of all types. Stay tuned for Part 2 of this series, when Martha and I discuss how districts are assessing criteria to achieve the Seal of Biliteracy, supporting teachers with diverse groups of language learners, preventing home language loss, and much more. How is interpretation different from translation? When is interpreting necessary and how is it mandated in schools and other community institutions? What are some of the challenges and pitfalls of “home grown” interpreting services? We discuss these topics and much more in our conversation with Michelle Gallagher. Michelle is the Managing Director of Cross-Cultural Communications, the leading national training organization for educational, social services and medical interpreters with more than 300 licensed trainers in 37 US States, Washington DC, Guam and six other countries. Michelle has more than 15 years of experience in facilitation and management of professional training programs for international audiences. She has taught at the Universidad Europea de Madrid and managed training organizations in Madrid and Maryland. She is also a freelance Spanish interpreter. Michelle received her BA in International Relations from Tulane University and her MBA in Marketing and General Management from the University of Maryland’s Smith School of Business. She spent nine years living in Madrid, where she received her MA in Conference Interpreting at the Universidad de Cluny. Michelle has volunteered for Youth For Understanding, an international student exchange program, since 2003 and has served as the Webmaster for the National Capital Area Translators Association, a local chapter of the American Translators Association. Please take our 1 minute survey about the Highest Aspirations podcast and other resources from the ELL Community! How might schools districts design programs that help teachers work with growing numbers of English Language Learners? What role does technology play in helping all students get the services they need? How is equity and advocacy work connected to school leadership? We discuss these topics and much more with Dr. Terri Bresnahan. Dr. Bresnahan began her teaching career in San Bernardino, California where she taught middle school math and Kindergarten/1st grade while earning her master's degree in Educational Technology from Azusa Pacific University. After 4 years in California, she returned to the midwest as a K-5 Computer teacher and technology facilitator while earning her CAS CAS in Educational Leadership. In 2005 she took her first administrative position as Director of Technology in Addison School District 4. She worked there for 5 years while beginning her doctoral degree at National Louis University. In 2010 she accepted the role of Director of Educational Technology in Park Ridge School District 64. In 2014 she was selected as the Assistant Superintendent of Curriculum and Instruction in Berkeley School District 87 and was named Superintendent the following school year. She has served in that capacity for 4 years and is proud to call Berkeley District 87 her home. How might we ensure that teachers are equipped with the empathy necessary to work with diverse groups of students? What kinds of professional development experiences are both practical and effective in supporting teachers who may not share the experiences of their students? What are simple steps anyone can take to learn more about cultural and linguistic diversity in their communities? We discuss these questions and much more with Laura Gardner. Laura has 16 years of experience working in public education, refugee resettlement, and social work. While in public education, she worked as a district level manager for immigrant family and community engagement as well as a school social worker. Laura also worked for Bridging Refugee Youth and Children’s Services (BRYCS) managing their national technical assistance initiative to federal Refugee School Impact Grantees. Laura has facilitated professional development on building the capacity of teachers and school systems to engage immigrant families in their children’s education, language access, cultural competency, equity, unaccompanied immigrant children, immigrant family reunification, and refugee resettlement. Laura holds a Master’s degree in Social Work from Columbia University and a Bachelor’s degree in Education. How might we help our English Language Learners engage in quality academic conversations? What supports do teachers of ELLs need to promote these kinds of conversations? How do academic conversations tie into college and career readiness? We kick off Season 2 of Highest Aspirations with these questions and much more in a conversation with Jeff Zwiers. Jeff is a senior researcher at the Stanford Graduate School of Education and the Director of Professional Development for Understanding Language, a research and professional learning effort focused on improving instruction and assessment of English learners and other diverse students. He consults for national and international teacher development projects that promote language, literacy, lesson design, and formative assessment practices. Jeff’s research focuses on developing classroom instruction that fosters high-quality oral language and constructive conversations across disciplines. Many listeners will be familiar with his book Academic Conversations, which provides clear ways to support students in developing authentic, meaningful classroom conversation skills. Zwiers' research and work has impacted tens of thousands of classrooms across the country in providing equitable access to grade-level content for all learners, reflective of college-and-career readiness standards. In this short episode, we recap Season 1 and preview what we have planned for Season 2 - coming in January, 2019. Thanks to all our listeners and guests for your contributions to our first season. On behalf of everyone at Ellevation, we wish you a happy holiday season! Check out all 30 Season 1 episodes wherever you listen to podcasts and discover more great content at https://ellevationeducation.com/ell-community. How has Lincoln High School designed and implemented systems to foster a welcoming environment for students that collectively speak over 30 different languages? What might schools do to ensure that all students, including ELLs and newcomers, have access to a wide variety of courses? How can home grown “cultural liaisons" help promote family and community engagement while also enhancing the teacher candidate pipeline? We discuss these questions and much more with Maira Méndez Rodríguez of Lincoln High School in Lincoln, Nebraska. As an instructional coordinator, Maira is an appraiser for teachers, test coordinator, and also coordinates parent engagement events. Another important part of her role includes student discipline for ELL students. To meet the needs of this diverse population of students, she works closely with the ELL team made up of a counselor, advocate, bilingual liaisons, teachers and other district staff. As part of her parent engagement role, she and her colleagues have collaborated with liaisons to host informational family nights in the native languages of the parents and guardians of LHS students. Prior to becoming an instructional coordinator, Maira taught Spanish and ELL classes to middle and high school students. Maira decided to pursue administration in hopes of having a greater impact on students’ educational journey beyond her classroom. She believes a strong partnership with the parents of students and the community is an asset in ensuring student success. What are some best practices to overcome challenges and ensure successful home visits for families of EL students? How might we set up activities outside of school (in neutral locations) so that families can come together? How can districts use creative funding approaches to pay for these programs? How can educators get started with this important work? We discuss these questions and much more with Jamie Combs. Jamie Combs is a National Board Certified ELL Teacher in her 14th year teaching ELL students at Northern Elementary in Lexington, KY. She also teaches future ELL teachers in ESL Methods courses online for Asbury University in Wilmore, KY. This is the second in a two part series featuring Katie Frances and Jamie Combs, who work collaboratively to maximize impact on ELLs and their families in Fayette County, Kentucky. Where are our Take the Pledge Scholarship winners now? How did their high school experiences prepare them for college life? What have they learned that they can now share with others? In this bonus episode, we speak with Maria Perez, a recent high school graduate from Tulsa, Oklahoma. We discuss her experience as an English Language Learner, the importance of family and teacher support, future plans, and even the profound influence of Don Quijote. Maria was the recipient of one of five $2,000 scholarships that Ellevation awarded to deserving English Language Learners to help them pursue their dream of a higher education. The scholarship is a result of our Take the Pledge initiative. The idea is simple: for each person who takes the pledge to advocate for ELLs, Ellevation adds $1 to the scholarship fund. If you haven’t taken the pledge yet, please visit takethepledge.net and help support students like Maria, who is currently finishing her first semester at the University of Oklahoma. How can EL teachers best learn about the sometimes complicated cultural backgrounds of their students? How might they confront the challenge of ensuring that other teachers and staff also have efficient access to this information? What cultural information is most important for content teachers (particularly those who do not have EL training) and how might EL teachers go about sharing it? We discuss these questions and much more with Katie Frances. Katie is a certified EL teacher in Fayette County, KY. She spent her first 8 years as a mainstream classroom teacher working with diverse groups of students. She currently teaches at Northern Elementary School, where she and her teammate Jamie Combs service over 150 English Language Learners. We’ll hear from Jamie in our next episode, which focuses on home visits for families of English Language Learners. How might we design professional learning opportunities that provide both a quality, personalized learning pathway and a path to licensure to work with English Language Learners? What are some of the advantages of utilizing blended and personalized learning strategies to bring diverse cohorts of educators together around ELL instruction? How can partnerships forged between school districts and local universities help move the needle on professional learning that will ultimately benefit the students we serve? We discuss these questions and more with Kristina Soprano. Kristina is the Director of the ESL Teacher Certification Program at Roger Williams University, University College. Prior joining University College at RWU, Kristina served as an ELL Coordinator for a charter school in MA, and also taught English learners at the elementary, middle, and high school levels in Massachusetts and Rhode Island. Kristina has also enjoyed supporting other educators with developing their knowledge and skills surrounding English learner education. She is an advocate for linguistically responsive and collaborative teaching models that embrace the assets that all learners bring to school. How might we leverage technology to facilitate collaboration and professional development across educational teams working with ELLs? What are some simple tech tools that can be used to bring people together easily and efficiently? How might we overcome the fear of using new tools to increase collaboration? We discuss these questions and much more in our conversation with Bret Gosselin. Bret has been a high school educator serving ELs for thirteen years. During that time he has worked with newcomers through LTELs both as a teacher and a specialist. He is passionate about seeing these students meet with success and loves collaborating with teachers in attaining this shared vision. Bret currently serves as EL Instructional Specialist at Garland ISD in Texas. He is passionate about seeing these students meet with success and loves collaborating with teachers in attaining this shared vision. In this episode, we speak with Abu Bakr a-Rabia about how how his journey to Canada as a Syrian refugee became a book written by his teacher Winnie Yeung. Abu Bakr talks with us about learning English, adapting to a very different life in Canada, and why it was so important for him to tell his story. Despite the struggles he and his family endured, his message is one of positivity and praise for the human spirit. When asked what advice he would give to teachers, ELL students, and school leaders Abu Bakr began by saying, “I would say it doesn’t matter where they are from or what they went through - they will come through it. All they need is a little bit of time to learn the language. Don’t let news or social media make a fear connection between you or make a bridge between each other. I would say communicate as humans. It is very hard at the beginning for both people - the one who speaks English and the other - because they don’t understand each other. But after they get to know each other more, they will know what the newcomer needs." As you’ll hear in the episode, reading the book Homes: A Refugee Story left a lasting impression on us. For that reason and many more, we were honored to speak with this remarkable young man. Homes: A Refugee Story tells the true story of Edmonton high school student Abu Bakr al Rabeeah, whose family left Iraq in 2010 in search of a safer life. They moved to Homs, Syria — just before the Syrian civil war broke out. As told to Winnie Yeung, Homes tells Bakr’s story of growing up during the Syrian civil war, and ultimately moving with his family to a new home in Edmonton, Canada. It’s a story that’s both heartbreaking and hopeful, about the devastation of war and the enduring love of family — an urgently necessary read for understanding Syria and what it’s like to be a refugee. What happens when an ESL teacher helps a refugee student tell his story? How can relating simple, day to day activities in a war-torn country help us understand that people around the world have more similarities than differences? Why is it so important to understand what our students want to do with their learning? We discuss these questions and much more in Part 1 of a two part series about the book Homes: A Refugee Story. Winnie Yeung, an ESL teacher in Edmonton, met Abu Bakr in the fall of 2015. What started as an attempt to help tell this refugee student’s story in a speech turned into a much bigger project, resulting in the publication of the book. "Homes: A Refugee Story tells the true story of Edmonton high school student Abu Bakr al Rabeeah, whose family left Iraq in 2010 in search of a safer life. They moved to Homs, Syria — just before the Syrian civil war broke out. As told to Winnie Yeung, Homes tells Bakr’s story of growing up during the Syrian civil war, and ultimately moving with his family to a new home in Edmonton, Canada. It’s a story that’s both heartbreaking and hopeful, about the devastation of war and the enduring love of family — an urgently necessary read for understanding Syria and what it’s like to be a refugee." (Freehand Books - Interview with Winnie Yeung, about Homes: A Refugee Story: http://www.freehand-books.com/books/homes-a-refugee-story/interview-with-winnie-yeung-about-homes-a-refugee-story) Be sure to listen to part 2 of the series (Episode 22) where we talk with Abu Bakr al-Rabeeah about his experience as a refugee who was given the opportunity to tell his story. How can making and sharing music bring together diverse groups of students? What skills does an educator need to incorporate tech tools to help students create culturally relevant and academically appropriate products? How can teachers of any subject leverage the power of music and technology nurture strong classroom and school communities? We discuss these questions and more with Sarah Minette. Sarah has taught for 14 years in public schools. She currently teaches a variety of music classes at Minneapolis South High School-a very large and diverse school in the heart of Minneapolis, Minnesota. Sarah is in the process of developing as many classes as possible to create multiple access points for students at South to experience music education. What gaps exist between resettled refugees and their communities and how might we go about bridging them? How can the simple act of spending time with one another in a common space help break down barriers? Why is it so important to move toward an asset based approach with newcomers and what they bring to our communities? In this episode, we are joined by Kitti Murray and Walt Anderson of Refuge Coffee. They talk with us about how Refuge is empowering refugees to use their many gifts to help create a vibrant community in Clarkston, Georgia - a town that has been called the most diverse square mile in the United States. By pursuing their goal to provide employment and job training opportunities to resettled refugees, creating a unique, welcoming gathering place in Clarkston, and telling a more beautiful refugee story to Atlanta, Refuge Coffee is on a mission to bridge the opportunity gap, the hospitality gap, and the awareness gap. How are schools accommodating English Language Learners with disabilities? What are some of the common challenges when working with these students and how might we overcome them? What impacts do EL and disability status have on reclassification or exiting? We discuss these questions and much more with Dr. Sara Kangas of Lehigh University. As an applied linguist, Dr. Kangas researches the educational experiences of English learners (ELs) with disabilities. Focusing on K-12 contexts, she is particularly interested in understanding how schools can create learning environments that support both the linguistic and academic needs of these learners. Dr. Kangas’ research also examines how educational equity for ELs with disabilities intersects with language policies and institutional structures. In this episode, award winning journalist Helen Thorpe joins us to discuss her most recent book, The Newcomers: Finding Refuge, Friendship, and Hope in an American Classroom. The book follows the lives of twenty-two teenagers from around the world over the course of one school year as they land at South High School in Denver, Colorado, in a beginner-level English Language Acquisition class. Many arrive directly from refugee camps, some after having lost one or both parents; together, their class represents a microcosm of the global refugee crisis as a whole. The Newcomers tells the story of what happens during the students’ first year in America, and it follows the journeys of three families in particular—from Iraq, Burma, and the Democratic Republic of Congo—illuminating what life is like in refugee-producing parts of the world. The book was published by Scribner in 2017. What opportunities exist for ELL Specialists to work as coaches to help content teachers better serve their English Language Learners? What strategies have proven successful and sustainable for supporting students in the long term? What are some of the obstacles that make this work challenging and how can anticipating them help maximize impact? We discuss these questions and more with Michelle Benegas and Amy Stolpestad, founders of the English Learners in the Mainstream or ELM project at Hamline University in St. Paul, MN. Learn more about Michelle and Amy and the resources they recommend during out conversation at https://ellevationeducation.com/podcast/highest-aspirations-s01-e16. How might a teacher use podcasts as a way to increase language skills of EL students? How can creating podcast episodes help newcomers become engaged contributors to their school communities? How can telling stories about family experiences in this format enhance cultural responsive practices? We discuss these questions and more with James Housworth, creator of the Hidden Voices Podcast. James is a a high school EL teacher in Roseville, Minnesota. He works with both ends of the EL spectrum, teaching newcomer SLIFE students (Students with Limited or Interrupted Formal Education) as well as advanced LTELs (Long-Term English Learners). James is currently researching the differences between L1 and L2 literacy acquisition to finish his Masters in Education at the University of Minnesota-Twin Cities. What are the implications of ESSA on ELL programs and instruction?What specifically are Title 1 and Title 3 administrators going to observe in the coming months? And how about principals and teachers? How is the K-12 world we know going to change in 2018-2019? We discuss these questions and more as Ellevation President and Co-Founder founder Teddy Rice sits down with Dr. David Holbrook of TransACT Parent Notices. We handed over the mic the Teddy - our in house policy wonk - for this episode because he is well-versed in ESSA, which led to a rich conversation with David. What are some of the barriers to family engagement in underserved communities? How can using basic technology help educators better engage with families of English Language Learners? How do we go about changing mindsets and perceptions of families who may not have had positive experiences with formal education or those who have limited education in US schools? We discuss these questions and more in our conversation with Heejae Lim. Heejae is the founder and Executive Director of Talking Points, an educational technology company whose mission is to drive student success in low-income, diverse areas through building strong partnerships across parents, schools, and communities. As she mentions in the episode, Heejae was influenced to start the company by her personal experience as a Korean immigrant living in London. We get into that and much more in our conversation. Many team members here at Ellevation Education recently participated in the company's 5th annual Hackathon. In this bonus episode, Steve sits down with Ellevation's VP of Engineering Eric Wong to learn more about what it is and why we do it. How do ELL programs and instruction differ in Canada? What supports are in place to help newcomers and their families succeed in their new country? How do educational systems in Canada support diverse populations of students? We discuss these topics and more with Paula Markus, former ESL Coordinator for the Toronto School Board and Sessional Lecturer at the University of Toronto. How do schools go about identifying and developing EL teacher leaders to help other educators work with culturally and linguistically diverse students? What strategies have been most successful in developing these EL teacher leaders? How do schools create a culture in which EL teachers can lead the way and serve as experts in their field? We discuss these questions as they relate to pre-service programs, professional development, co-teaching models and more in our conversation with Dr. Felice Russell from Ithaca University and Dr. Kerry Soo Von Esch from Seattle University. How can project based learning strategies help accelerate the learning of ELLs? What kind of community partnerships work best when implementing project based learning in schools? How might teachers facilitate learning outside of the schools in ways that are mutually beneficial to students and community members? We discuss these questions and much more in our conversation with Donna M. Neary. Donna teaches high school Social Studies to English learners in Louisville, Kentucky. She is part of a team that piloted the Accelerate to Graduate program at her school. Donna’s role on the team is to teach US History, World History, Exploring Civics, Global Issues, and Humanities. Her concentration on the importance of field trips to student learning is firmly rooted in her experiences guiding tours for students and observing the impact that being in proximity to art, history and authentic artifacts has on development of students critical thinking skills and cognition. What does it take to build a new school from the ground up in a high ELL demographic area? How do school leadership and mission driven initiatives impact the culture of the school? How does a new school recruit, train, and retain highly qualified teachers to work with underserved populations? We discuss these questions and much more with Ruben Alonzo, Founder of Excelencia Charter Academy in East Los Angeles, California. Ruben talks with us about how his profound personal and professional experiences influenced him to leave Texas and start his own school in Los Angeles. During the conversation, we learn about leadership, planning, professional development, and innovative school models. Just as importantly, Ruben’s contagious passion and dedication to this work serves as an inspiration for anyone who works with underserved communities. How can ELL stakeholders tap into the power of Professional Learning Networks (PLNs) on Twitter and beyond? What should ELL teachers do to be viewed as experts and advocates in their schools? What resources are most powerful for those just getting started? We discuss these questions and much more with Emily Francis. Emily is an English as a Second Language teacher at W.M. Irvin Elementary School in Concord, North Carolina. She serves students in Kindergarten through fifth grade with various English proficiency levels. Emily’s experience as an English Language Learner inspired her to become an ESL teacher and affords her a deep understanding of the challenges her students must overcome to find success. She serves as a professional development facilitator, motivational speaker, Keynote, ESL PLC lead, cooperating teacher, and mentor to beginning ESL teachers. As a leader, Emily’s focus is to inspire students to dream more, learn more, do more, and become more. What does rigor mean for students with interrupted formal education (SIFE)? How do we recognize and leverage the experiences newcomers bring to improve the education of all students? Why is it important that educators embrace a mindset that constantly challenges beliefs about students and what they are capable of? We discuss these topics and much more in our conversation with Carol Salva. Carol is a former elementary educator and has most recently taught newcomer English Language Development in both high school and middle school. She is also a consultant with Seidlitz Education, where she specializes in using researched-based sheltered strategies to teach grade-level content to unschooled/under-schooled language learners. With proven success including these students in content area classes, Carol is able to support teachers to make these efforts practical and to the betterment of the general population. How do we engage English Language Learners in community programs? What supports are effective in helping immigrant students thrive beyond the school walls? How might we partner with outside organizations to create mutually beneficial programs for communities and newcomers? We dive into these questions and much more as we continue our series on family and community engagement with Anna Leversee. Anna manages the Enroot program in Somerville, MA. Enroot’s mission is to empower immigrant youth to achieve academic, career, and personal success through inspiring out-of-school experiences. A firm believer in quality education for all, Anna is energized by working with people who volunteer their time and talents to make this goal a reality. We chat with Anna about the power of partnering with community organizations to help immigrant youth reach their highest aspirations. What does the research say about family and community engagement and its correlation with academic achievement? How can school leaders help teachers implement family engagement strategies that work for diverse groups of students? What can schools to to get started with this important work? On this episode, we are pleased to welcome Stephany Cuevas as we continue with our series on family and community engagement. Stephany is a doctoral candidate at the Harvard Graduate School of Education. Her research focuses on the relationships mixed-status families and undocumented parents have with systems and structures of higher education; she studies how immigration status and notions of legalization influence and shape families’ perceptions, understandings, and relationships with higher education. How can schools and communities come together to support immigrant students and families? How do we go beyond the open house at school and bring people together in new ways? Renata Germino started the Bridges Through Bread program in Charlottesville, VA to bring a diverse group of people together around a universal topic - food. We chat with her not only about how we can help immigrant families, but also about how they can help us. What does it take to run a successful dual language program? How can schools find teachers and resources while also striking the appropriate balance of students who most benefit from these programs? We tackle these questions and more with Daniela Anello, Head of School at DC Bilingual Charter Public Charter School. DC Bilingual has one of the largest percentages of ELLs in the district, but it is also among the 3 highest performing K-5 schools. Join us as we will explore some of the keys to their success. How do we navigate all the buzzwords, acronyms, and definitions of Dual Language learners and programs? What are the benefits to these programs for English Language Learners, Dual Language Learners, and native English speakers? What are the challenges schools and communities are facing in implementing them and how can we begin solving them? We tackle these questions and more as we kick off our series on Dual Language Programs with Dr. Conor P. Williams. Conor is a senior researcher in New America's Education Policy Program where he founded the organization's Dual Language Learners National Work Group in 2014. His work addresses policies and practices related to educational equity, dual language learners, immigration, and school choice. His writing has appeared in The Washington Post, The Atlantic, U.S. News and World Report, among many others. Before joining New America, Conor taught first grade in Crown Heights, Brooklyn.